Pre-drawn HVAC symbols represent actuator, air cleaner, air conditioner, air curtain, building chiller, condenser, diffuser, damper, ventilator, etc. Vector symbols help develop accurate and presentation-quality diagrams and documentations. From the P&ID HVAC symbols library, you will gain a great range of high quality P&ID HVAC symbols. 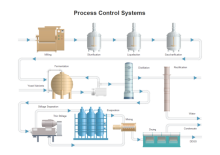 These symbols are great resources when you create piping and instrumentation diagram. Here you will have a general overview of the symbols on how they look like and how to use them in diagrams. 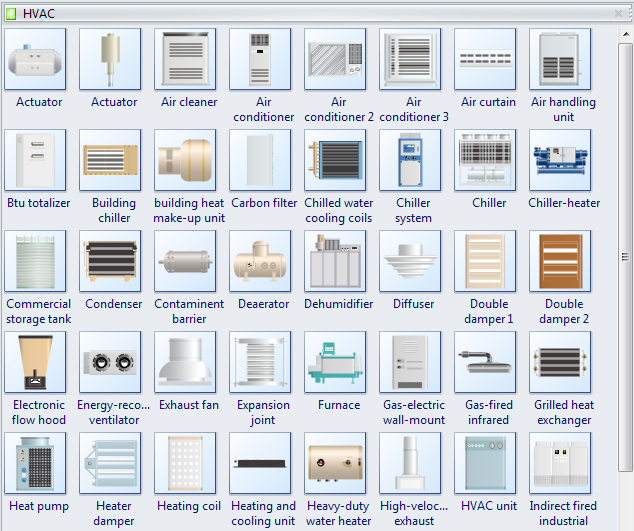 Edraw HVAC symbol library contains a great range of HAVC shapes. 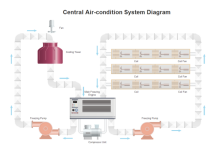 You will find actuator, air cleaner, air conditioner, air curtain, building chiller, condenser, dehumidifier, diffuser, grilled heat exchanger, heat pump, electronic flow hood, roof vent, damper, ventilator, and more. Air Cleaner is a filter that prevents dust and other particles from entering the air-intake of an internal-combustion engine. 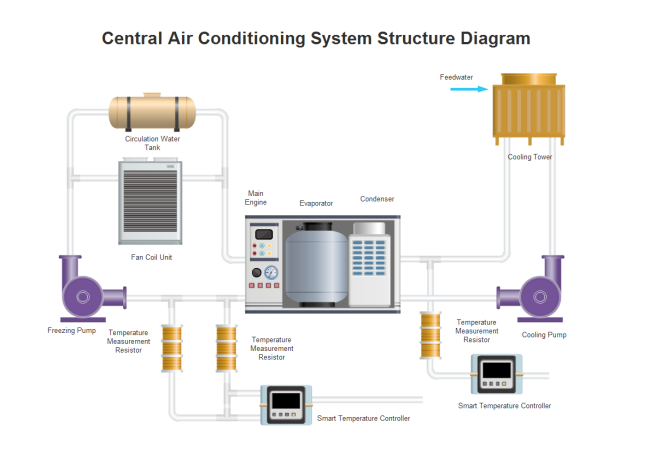 Air Conditioner is an apparatus for controlling, especially lowering, the temperature and humidity of an enclosed space. Building Chiller is a device used for lowering a building's temperature. Ventilator is a device that circulates fresh air and expels stale or foul air. Deaerator is a device that is widely used for the removal of oxygen and other dissolved gases from the feedwater to steam-generating boilers. 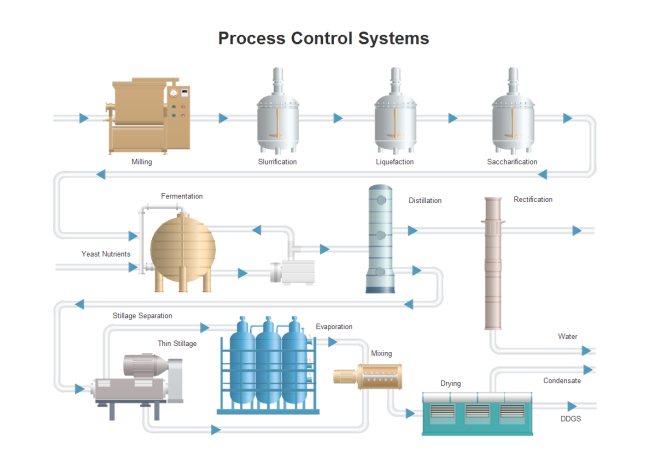 This group of symbols are included in Industrial Automation category of the symbol library. When you start a Utility-Generation P&ID drawing template, the symbol library will open automatically. You can drag a required shape from the library and drop onto the canvas. The shapes you've got are vector graphics, which are fully customizable. You are able to scale the shape to any size without loss of the display resolution. You are able to change filling colors freely to match your own theme. To make the shapes tailored to your requirements, you can take out a part or add additional elements easily. To do this, first you need to click Ungroup button to ungroup the shape under Home menu. 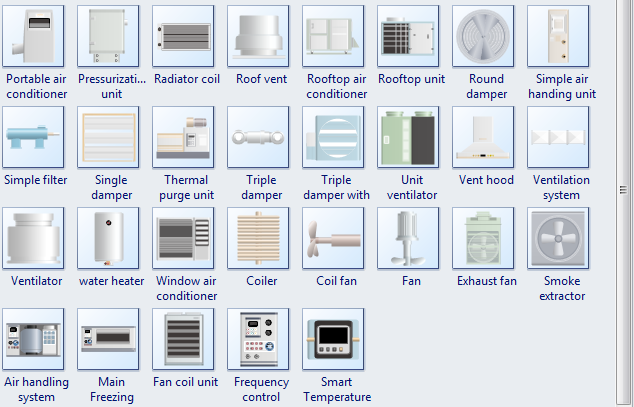 You can discover more HVAC symbols through our library symbol searching. In order to better understand the application of Edraw symbols, here we provide some complete P&ID examples using HVAC symbols.